Including 3 rounds of golf at Son Vida,Son Muntaner and Son Quint. You will be playing on the island’s oldest golf course, Golf Son Vida , located on the outskirts of Palma in the exclusive area of Son Vida. It hosted the European Tour Open de Baleares in 1990 and 1994 where the winners were Severiano Ballesteros and Barry Lane. In 2001 it was redesigned. It is a classic course, which alternates the first round with narrow fairways surrounded by tall pines and the second, more relaxed and with less vegetation. It is suitable for all players. Golf Son Muntaner,located on the outskirts of Palma, between the hills of Son Vida, in a wonderful setting surrounded by pine trees and Mediterranean vegetation. Some of its holes are visually very beautiful and it is known for its landscaping and good maintenance. The fairways are wide and open, with only few water hazards. The terrace of the clubhouse is remarkable with its spectacular views over the countryside and highly recommended for its sunsets. And finally, Golf Son Quint, the youngest course on the island. 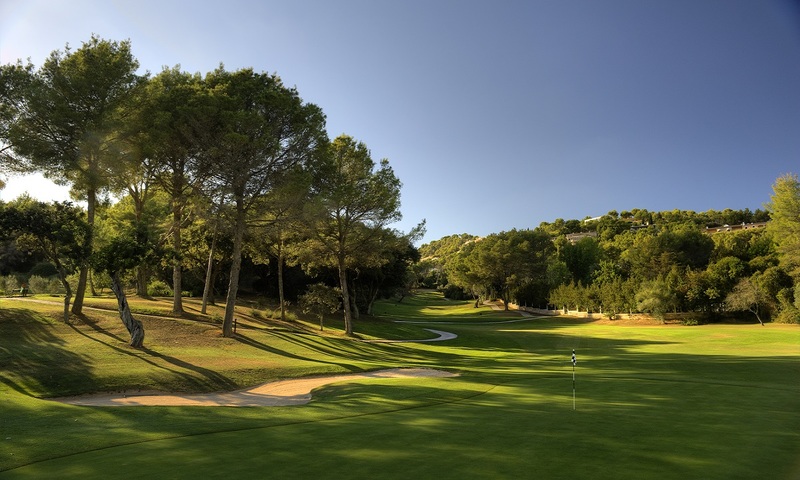 It has beautiful vegetation thanks to the stately pine forests and views of the bay of Palma from some of its holes.With wide and long fairways, nothing looks artificial and is very well integrated into the environment. Go back to list of packages Book now!